Home » 5 Freshest » EatingEVOLVED: Taste Devolved. But Healthy. Man did I want to like these peanut butter shaped cups I bought at Whole Foods. The packaging makes me hungry, the main title ingredients read flavorful, and heck – I love bespoke(ish) candies. Small batch (I’d assume, at least compared to a Snickers) foods tend to be better than mass produced. 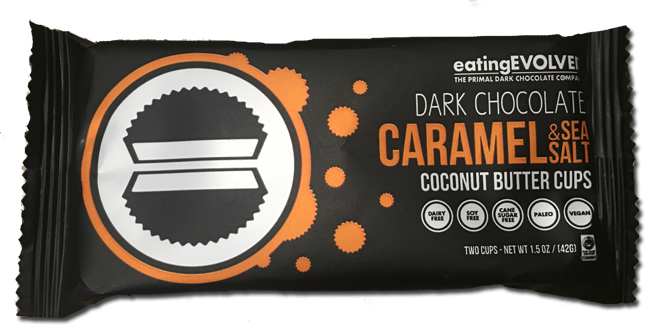 Yet, the eatingEVOLVED Organic Coconut Butter Cups with Caramel and Sea Salt are lackluster at best. Coconut – Yes, please. Kids don’t like it but who cares about kids. Us adults know coconut rocks. Butter Cups – Have you HAD a Reese’s before? Think they’re good? Yeah us too. Caramel & Sea Salt – Agreed, overplayed at this point but there’s a reason for that: they’re great flavors that taste great together. Coconut – an ‘essence’ of the flavor. Didn’t taste real, more like a McCormick flavor extract. Butter Cups – a chalky texture. Barely holding together when I broke it apart, it was like dry-as-hell paste in my mouth. Caramel – pedestrian at best. Like a weak version of the Brach’s Caramels my gramma left out for years on her coffee table. And no Salt to speak of. They weren’t actually salty. Again, more of an essence of what someone thinks salted caramel should taste like. So for our friends who have dietary restrictions and care enough about the environment to buy your snack foods accordingly, then perhaps these are for you, and feel free to procure below.